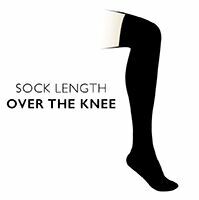 Silky soft and smooth, these over the knee socks are the height of fashion. They are also made from natural, environmentally friendly yarn from Bamboo. Its anti-bacterial and anti-allergenic properties make these socks ideal to keep feet healthy and are perfect for sensitive or allergy-prone skin. As well as being three times more absorbent than cotton to keep your feet drier for longer, it also keeps them 2degrees cooler in summer and significantly warmer in winter. All that and a classic look too!